One Great Hour of Sharing Offering – Your generous contribution to this annual offering goes to make a difference in the lives of those seeking to build a better life, those facing starvation, hunger and food insufficiency, and those desperately needing assistance in the wake of disaster. Mark YOUR Calendar for Sunday, May 5th—Why? The members of the Session invite you to join them in the first of 4 annual meetings to listen, focus, discuss and lay out plans for the work of Old South Haven. OSH is small, the Session even smaller. So we need to come together to go forward in ministry together. On May 5th our focus will be on Mission – in our neighborhood, our nation and our world. 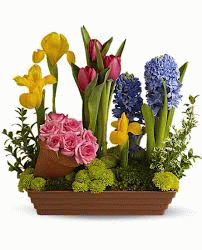 We are looking for hands-on ideas and where we should put our monetary gifts to the best use. Be there in the gallery following fellowship time. STAKES in the Lawn -- Keep an eye out for the three red tagged stakes on our lawn. Soon there will be three new trees in their place. The trees will come to us courtesy of the Brookhaven Village Association. The 2019 Per Capita Assessment is $38.05 per member of Old South Haven. It is broken down as follows: $8.95 to the General Assembly, $4.10 to the Synod of the Northeast and $25.00 to the Presbytery of Long Island. Per Capita is – "the tie that binds" –annual support that unites the entire church in the ongoing and essential work that guides the Office of the General Assembly, the life of the Presbyterian Church (USA) and benefits every congregation and every mid-council ministry. Old South Haven remits the full per capita assessment. You can help free funds for other purposes here at Old South Haven by paying your individual per capita. Mark checks or envelopes for 'per capita." Many Thanks to those of you who have already paid your per capita. you created all things in wonderful beauty and order. as the sign of your covenant with all living things. worthily offer to you our sacrifice of thanksgiving. your wonderful deeds of old shine forth even to our own day. through the grace of Baptism. and with your hands you molded us in your image. Everywhere we see signs of your loving care. through Jesus Christ, the way, the truth, and the life. Amen. and by your Spirit you renew the earth. lives and reigns forever. Amen. and covered us with righteousness. of Jesus Christ our Savior. Amen. you have established a new covenant of reconciliation. and out of death into life. you will not let the flames consume us. look with mercy on your whole church. your Son, Jesus Christ our Lord. Amen. this holy night shines with the radiance of the risen Christ. It gives me great joy to invite you to worship with us this Palm Sunday. 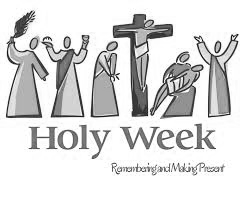 As we begin our Holy Week journey to the cross and beyond; we will also be celebrating the ministry of the Rev. Jeanne Baum as we confer on her the honor of Pastor Emeritus of Old South Haven Presbyterian Church. Join us as we welcome her home to a congregation she (and husband Bob) served faithfully and well. And wave a palm while shouting Hosanna! If you wish to carpool meet at the church at 5:45 pm, Please let Pastor Karen know if you are planning on going. 10 Park Hill Dr., Selden, NY 11784, Refreshments will be served. Last Sunday we had the opportunity to listen to Elder John Hile (Deer Park) tell us about the work the El Salvador Partnership is doing with villagers to ensure that they have clean potable water year-round. He also shared with us how recent drought conditions have destroyed 90% of the crops the villagers depend on to buy staples like salt and oil. Your offering in support of the Partnership's ministry was a generous one and we will be sending on $528 in support of their work. Thank you to everyone who contributed. "One church that I have been working with saw the benefit of telling stories. Through a strategic planning process, church leaders determined that they needed to have a bigger connection to their community. Instead of always planning events at their facility for others to attend, they decided to find things in the community that they could attend. Church members started participating regularly in a community dinner. Over time, those attending had the opportunity to share things that were going on at the church. One of the ministries they shared with those attending the community dinner was the after school program they hosted for children who would arrive home after school to an empty house." One day, a check for $100,000 showed up at the church office for the after school program. When the pastor reached out to the donor, she learned that the donor heard a member talk about the program at one of the community dinners. The donor was so moved by the program and the fact that members were an active part of their local community that he sent in the check. Now $100,000 dollar checks aren't and everyday occurrence. But I do know this, the Good News of the Gospel travels on the words we speak, the stories we tell and the work we do in the name of God who called us into being. To my Friends at OSH Church—Thank you, thank you, thank you! For the most beautiful flower arrangement and the card which cheered me. Also reminded me of how much I miss you all. Sorry it's been so long but this is the first time I'm writing at all since my fall. I've been so shaky. Karen comes every week and gives me the news of what is going on. I wish I could be a part of the "Plumb Line" meetings. Sounds interesting. Every Sunday in my mind I worship with you—in prayer, and song and scripture reading. God bless you all. This week's Lenten Wednesday soup and reflection will be held at St. Joseph the Worker Roman Catholic Church (510 Naragansett Ave., East, Patchogue) at 6:30 pm. The reflection time will begin at 7:15. Our collective mission in this season is our local food pantries. Please bring shelf-stable milk for the food pantry. Sunday morning, we will welcome Elder John Hile from the El Salvador Partnership of the Presbytery of Long Island to our service. He will be sharing some of the work the Partnership has been doing over the last few years. In addition, with the approval of your Session we will be collecting a special offering for a current project. In a letter to all members and churches of the Presbytery the Partnership Pastoral Team described the need for food staples and asked each of us to help make a difference. Food relief assistance is needed at this time as the drought has ruined everyone's crops. Rural Salvadorans live off of the corn and red beans they harvest. This past summer, on average families lost 90% of their crops. If you need help imagining a loss of 90% of your available food, then close your eyes. Picture your cupboards, pantry and fridge after you have shopped for the coming week. Odds are you had enough money to pay for those groceries and the store where you shopped has a ridiculous amount of food from which to choose. Now imagine 90% of that food gone. Picture that. And you have no resources to replace what was lose. And you need to feed your family for a whole week on what remains on those shelves. Now imagine this will be your year. You have children who need to be fed. And you have, pretty much, nothing to offer. This is why the Partnership is asking for your help. $35 will provide a good-sized basket of food staples about what it would cost for a fast food meal for a family of four. There will be offering envelopes in the bulletins this Sunday. Please give as you are able and know that your gift will make a real difference in someone's life. a quarterly planning meeting was set up to which anyone interested in life of the church is welcome to attend. The first of these meetings will be held on Sunday, April 7 following Fellowship. In other action it was noted that a third company has been contacted for an estimate on repairing the bell. Three trees are to be donated and, with Eric's assistance, planted on the property this spring. May 25th was set as the date for the next church fair. And, dates for the Pastor's vacation this summer were approved. The final PLUMB LINE POTLUCK AND CONVERSATION will be held this Sunday evening at 5 pm. Even if you haven't been able to attend the first two please make an effort to join us for this discussion. Your input is important to us. Please bring a dish to share. The Deacons are providing beverages and desert. This week's Lenten Wednesday soup and reflection will be held here at Bellport United Methodist Church (185 S. Country Rd, Bellport) at 6:30 pm. The reflection time will begin at 7:15. Our collective mission in this season is our local food pantries. Please bring a non-perishable snack item, such as granola bars or nuts. This week I'd like to share with you selections from one of the "Minutes for Mission" for the One Great Hour of Sharing Offering this year. "Here is the big question: What is 'the church?'. . .Think about this: As the wider culture becomes less traditionally religious, the church—something we share as a congregation and individually dear in our hearts—becomes less understood, or misunderstood, by many. Like it or not, it is a fact. And as hard as it is to admit, sometimes we too fall into the trap of reducing 'the church' to the buildings where people gather on Sunday morning. . . .Many of us learned in our childhoods that 'the church' is the people –its you and me. "here is the church, here is the steeple, open the doors, see all the people.". . .this rhyme is a useful reminder that the church isn't a building. . .I think we might unlock something else in that simple rhyme. . .As we sit inside the building today, we need to open the doors and se ALL the people outside the doors: people whose home have been washed away by hurricanes and floods, people trapped in systems of injustice and oppression, people who will go to bed tonight hungry or without a roof over their heads. . . .The church's identity is defined by opening its doors and joining with the most vulnerable of God's children in the world. . .The church's identity reflects the call of Isaiah to become repairers of the breach. It is through One Great Hour of Sharing that Presbyterians together open our doors to become the church with all the people we see. SAVE THE DATES: The final PLUMB LINE POTLUCK AND CONVERSATION will be on Sunday, March 24th at 5 pm. This week's Lenten Wednesday soup and reflection will be held here at Christ Episcopal Church (64 South Country Road, Bellport) at 6:30 pm. The reflection time will begin at 7:15. Our collective mission in this season is our local food pantries. Please bring a non-perishable lunch item, such as peanut butter, jelly or canned tuna.